Roll on over to PAL on Friday, March 15 when we put away the basketballs and bring out the roller skates! 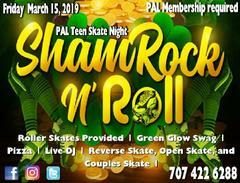 Bust out your greens, get ready to lace up those skates and get ready to roll at the March PAL Skate Night, ShamRock n’Roll! Skate nights are FREE with a PAL membership, and feature roller-skating to a live DJ, pizza, contests, a glow gallery, couple skates, reverse skate, and open skate. Skate trainers are available for students new to roller-skating. Skate night runs from 7:00pm to 10:00pm. The skates were purchased thanks our PAL’s at the Matt Garcia Foundation. Roller skating is recognized and recommended by the American Heart Association (AHA) as an aerobic fitness sport. Studies have shown that roller skating provides a complete aerobic workout and involves all of the body's muscles, especially the heart. Today, teens need help and encouragement to stay in shape and live a healthy lifestyle. Roller skating provides a great way to exercise and teens get to do what they like to do more than anything in the world - hang out with friends and listen to music. While they are socializing with their friends on skates, the activity itself is better than running the same distance. The Fairfield PAL Program is open to Fairfield, Suisun, and Travis students ages 13-18 who are enrolled in school. Memberships are $10 per year and can be purchased at the Fairfield Community Center (1000 Kentucky Street) Mon-Thursday between 11:30-5:30pm. A current student ID is required to register.